« How big of an impact is Internet-delivered video making in consumer living rooms? Another major player enters the PC to TV space. 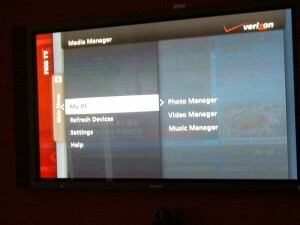 Verizon is currently beta testing web video on their set-top boxes, reports Zatz Not Funny. Unsurprisingly, the content looks like it will be mostly user-generated or that which has been created specifically for the web, and therefore won’t compete directly with the telco’s own video-on-demand offering. Initial “marketing partners” to include Veoh, Blip.tv, Break.com, and YouTube. On the downside, a PC is still required to act as a bridge between Internet content and the TV via Verizon’s DVR set-top box, notes Dave Zatz. Unlike TiVo which taps directly into YouTube’s H.264 content, Verizon utilizes their Media Manager PC software as an intermediary. Sites are indexed on a regular basis and when a video is selected from the DVR, the PC software automatically transcodes and streams content on the fly. In addition to pulling in content from supported video aggregation sites, Verizon’s Media Manager software “also facilitates shipping virtually any video podcast to your DVR”. Podcast subscriptions can be added directly to Media Manager in the standard way via the PC’s web browser. The new features will be offered as part of Verizon’s top tier DVR package, which currently includes PC photo sharing and multi-room DVR playback, and is expected to be offered to customers later this year or early next year. Thank heavens, TV without commercials, and all you will need is a car size battery, a one teribyte memory chip, a pair of reading glasses, and be in a location that gets a show you want to watch. GREAT!